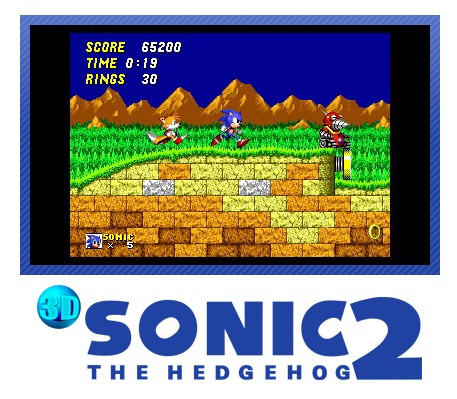 The blue blur returns to the Japanese 3DS eShop next week in M2’s 3D revival of the classic 1992 SEGA title, Sonic the Hedgehog 2. To celebrate the special occasion, SEGA has released a trailer of 3D Sonic the Hedgehog 2 on its new microsite. If this alone wasn't already enough, the trailer & microsite also reveal the title will support local co-op play, allowing a second player to take on the role of the character Tails – provided they own their own copy of 3D Sonic the Hedgehog 2. Co-op mode has previously featured in 3D Streets of Rage. 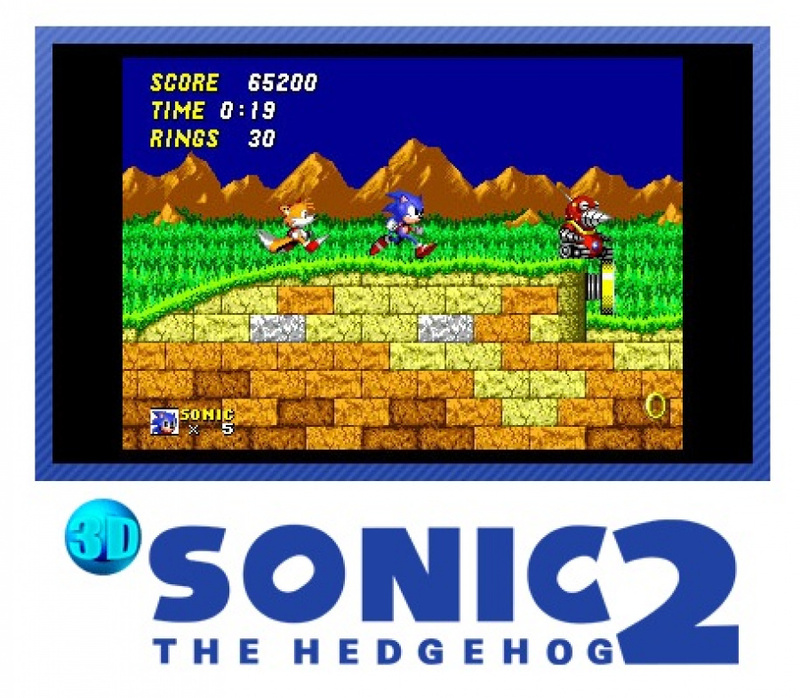 Like other releases in M2’s 3D Classics line, Sonic the Hedgehog 2 will include the ability to change the game’s screen display, remap button controls and enhance the overall enjoyment of the user experience with many other optional adjustments. Take a look at the trailer below, and let us know in the comments if you intend to pick up 3D Sonic the Hedgehog 2 when it arrives here in the West. Sweet. Was hoping for this game for quite some time. I was also hoping for Download and Play, but Nintendo has pretty much abandoned that at this point so it doesn't matter. Why is M2 afraid of Download Play? Anyone remember that weird single cart co-op that Kirby Superstar Ultra had, where only the host's DS actually displayed the game? At least it's not that. But some kind of download play multiplayer really should be in there. Too bad it isn't download play. I have a second 3DS but very unlikely to buy a second copy of the same game for my own home. I don't care about that extra crap. I just wanna play this game. So excited! Can't wait! A lot of people so far upset it doesn't have download play. I totally forgot there was such a thing as download play. Now I feel disappointed it won't have it as I don't think I know anyone who'll buy the game but would have played co-op. How soon is this coming out in Europe? Is it..... Maybe this month? Awesome! I'll definitely be getting this, hopefully I can convince a friend to get it too. All that showed was the 2P verse mode. What would be cool if the person controlling Tails in the main game had their own screen. @Cloud02: They have made modifications to previous 3D Classics before. They may add an option to play though Hidden Palace. @DekersHekers How has Nintendo abandoned Download Play,it wasn't their decision to put it in or not. Nintendo has used Download Play in some of their first party titles recently though. The Sonic The Hedgehog 2 I remembered is already available, because I used to play the Master System version when I was younger. can't wait for this game. My favorite game of all time. If you can't wait for this then the sonic sega collection for ds should more than hold you til it comes out in 2 months. This and Gunstar Heroes are launch day purchases for me. Here's hoping that they port over Sonic 3 and Knuckles at some point too! @allav866 knuckles wasn't in sonic 2 dude! how about Sonic & Knux? or Sonic CD 3D Sega. Hm? No Download Play & no Hidden Palace Zone. Not surprised. Also, is this truly CO-OP? Isn't this just the race mode? @ULTRA-64 He was if you attached the game to a Sonic & Knuckles cartridge. Many Sonic Genesis compilations have the ability to play as Knuckles. Anyhoo, can't wait to get my hands on this!! Does the sound in the video sound really harsh to anyone else?? I hope they include an EQ so I can turn down some of those high frequencies. This game already exists in so many forms (many of which I already have) to even contemplate another purchase. 3D isn't enough to justify buying it for the umpteenth time...now a Sonic Adventure 3DS port with enhanced features and Chao garden, that would be something worth getting excited about. I bet the special stages look sweet in 3D. Sadly, it looks like Tails will still do everything he can to thwart your chances of glory. This was my first Genesis game back in 6th grade. I never got to play Sega until then (was born in 85.) I absolutely fell in love. This is my favorite Sonic title. 3&K were awesome, but this one just has a much faster feel to me. It has an accessible and addictive charm. I can't wait for the 3D version!!! I already have so many versions of this game, I don't need it. In any case, when is it coming out? Regarding download play... wouldn't it have to download the entire 3D Classic into the 3DS' s RAM? Can it even fit into the RAM all at once? If it was a direct emulation, then maybe. I'm not sure what the size of the 3D Classics version is compared to a regular emulator + ROM, like the VC. EDIT: Also, it probably can't use ALL the RAM, since the 3DS' s OS and other functions need some RAM to function. And even though the 3D Classics are also emulations... they're heavily modified, I imagine. Change that to Adventure 2 and I'd be game. 1 was meh. I support all the 3d Classics on 3DS and will be buying this as well. Thanks for another great one M2! I'm waiting for the day we see Shining in the Darkness 3d and Power Drift. Sega puts more love into their VC games on Nintendo systems than Nintendo itself does. Glad to have this one coming soon. @allav866 Doubt it, seeing as how you needed Sonic & Knuckles to do that. Though it would be cool if they included the ability to play as Knuckles in this. Sega is so good at this. I wish Nintendo would ask them for help when it comes to VC kinda stuff. Aw, man. I thought it was like revamped, where player 2 gets his own screen as Tails in the story mode. That would blow my mind. @Seanmyster6 Nintendo themselves don't put in any multiplayer in their VC Game Boy games. Instant download for me, when it becomes available! Easily the best game coming to 3DS this year! Ughhhh, i would have bought it if it had download play. At least they are headed in the right direction. Good on you, Sega! Ya this is one of the greats I've been waiting for. Now if they'd just release Sonic 3 and Sonic & Knuckles. And maybe if you buy Sonic & Knuckles and own the other Sonic games it could unlock what it did on the Genesis- sphere ring levels with Sonic 1, Knuckles in Sonic 2 and the new campaign for Sonic 3. Another talented upgrade from the team at M2. @Seanmyster6 I know, same with Gunstar Heroes right? I hope more 3ds classics will have multiplayer, and other customizable stuff. Plus I hope more sonic 3ds classics still come like sonic CD and hopefully if they do sonic 3, they will do sonic 4 ep 1 & 2. So I'm curious, if you do "1p mode" where one player can control Tails as he runs along side Sonic like you could on the Genesis, I see that this kind of multiplayer is confirmed to exist in the title, but I'm curious, does this mean that the player playing as tails in that mode, will have the camera stay focused on Tails on their 3DS so that if he runs too far away from Sonic he doesn't automatically fly back to Sonic since the camera typically only focuses on Sonic. Does anyone know if that's what they're doing? I see that this game does seem to have some new features, so I wouldn't be surprised, but I would be so happy if this is the case. AWESOME! lets hope for 3! @NintendoFan64 If M2 can add the Spin Dash to Sonic 1, they can add Knuckles to Sonic 2. The only difference is that at least Knuckles has been in the game before.